I am so excited, today I am a guest designer for Pretty Paper Pretty Ribbons. Her Cutting Files are just amazing and so fun to play with!!! I used that cool little chicken along with the center layered label for my card base. I love that shape and I am sure to use it on a lot more cards along with the other images! 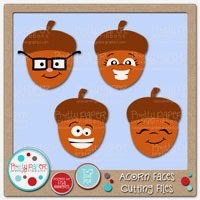 I used the two Acorns on the bottom and the Happy Tree as the card base, aren't they just adorable!?! I just couldn't resist, I had to put an action wobble on it, so cute! 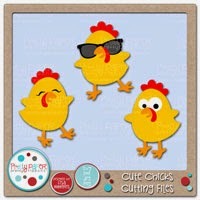 I truly love her cut files, and she has so much more for your crafting pleasures too! I hope you have enjoyed my projects! CUTE!!! Love the "action wobble"! I, too, love that shape for the card...love creating shaped card bases! Wow, Melissa! Congrats, u did an awesome job!!! Congrats on your GDS!! Both are ADORABLE!! I love how you did the sunglasses, the awesome textures and the wonderful faux stitching! Super cute and fun cards! Thanks for making me smile today!